Happy Labor Day everyone! It's another long weekend and I'm spending it with much gusto. Short breaks such as this, is an opportunity to be had. It's actually a welcome respite from the usual busy weekdays. I had so much time to kill today that I thought of consuming it well in the kitchen. Hence, as usual, I rummaged through some cookbooks and my wandering eyes led me to Dave Lieberman's Dave's Dinners. As I perused his cookbook, his Chocolate Cake recipe instantly caught my curiousity. He named it his Best Chocolate Cake Ever. Need he say more? Of course, that's more than enough reason to give it a whip. So here's how my take on his recipe turned out. Overall, indeed it's chocolatey. However, I was expecting for a more decadent cake. It's moist but I was looking for something more. Maybe because I used a low fat yogurt instead of a full-fat one. Other than that, I still enjoyed a scrumptious nibble out of this cake. For the longest time, I've been planning to make a pavlova cake at home. But for some reasons, I can't seem to find a convincing recipe to work on. After much research and browsing, I've settled down on a Gale Gand's recipe. I was just actually looking for a good recipe for the meringue base as I have already planned my toppings. The original recipe calls for red wine vinegar but I substituted it with balsamic vinegar instead. There are a lot of variations available for this New Zealand and Australia's favorite dessert. However, the meringue base is key that's why it can't be compromised. Initially, it may seemed to be a bit tricky to make. But as soon as you get the hang of it, it's very easy to do. Happy Birthday, our Dear Riley! Has it already been 7 years? How time flies unbelievably fast! Our dear Riley is celebrating his 7th birthday today. We brought him to Hongkong Disneyland a few weeks ago for an advance birthday celebration. 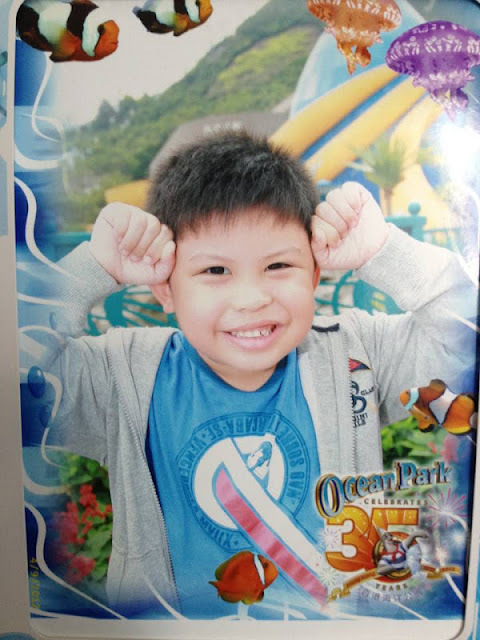 This weekend, we’re bringing him to his favorite spots in Singapore – Universal Studios and the Singapore Zoo for an extended birthday treat. Hongkong is indeed a shopping paradise. It will definitely top the list of the shopping meccas in asia. I can easily claim it as my favorite go to place when it comes to shopping. It literally has everything. From the simplest and most sublime to the most classy and luxurious of all things, name it and they have it. In terms of trends and innovations in fashion, they were never too late. What's even amazing is that, anywhere you go in the island there's always something to look forward to that's related to shopping. Since our hotel is located in Kowloon area, the likes of Nathan Road, Mongkok and Canton Road were our shopping haven during our visit. But I'm sure there are so much more than these famous ones. If you have the luxury of time, it'll be worth exploring the different parts of the territory. Prior to the arrival of Disneyland, Ocean Park is considered the most premier theme park in Hongkong. In terms of location, it boasts of a more panoramic view and ambiance. It's divided into two sections, the Summit and the Waterfront. The Summit features the exhilarating rides and attractions. It's located on higher altitude and you have two options to reach it, either through a cable car ride or an ocean express train ride. We took the cable car on our way to the top and the ocean express on the way back to the ground where the Waterfront is. Both experience are a must. In the Waterfront area, you'll find the most popular attractions in the park like the Grand Aquarium, Giant Panda Adventure, Hongkong Jockey Club Sichuan Treasures and others. Finding a place to dine at Hongkong Disneyland is not a problem at all. There are a lot of restaurants / food stations in all the 5 main attractions. We tried Corner Cafe at the Main street for dinner. The restaurant offers western cuisine and it looks to be popular since oftentimes there's queue outside the restaurant. The ambiance is victorian style and the food choices from the menu are mostly american. The service is very cordial and relatively fast. Here's the kids meal served on cute Mickey plates. Even the veggies and fruits were shaped into Mickey's face. So cute! I opted for a roasted chicken and it was nice. It's tender and succulent. We still wanted to try some desserts but we're already too tired and somehow filled, so we just decided to head straight to the hotel. When we come back on december, we'll definitely try the other foods on offer at Corner Cafe. It's touted as the happiest place on earth and for the second time around Disneyland proved it to me again. This is simply the place where you wanna be and the memories you'll have are definitely meant for a lifetime. I've been to Tokyo Disneyland Resort a long time ago. This is my and my family's first time at Hongkong Disneyland. But I just realized, regardless of which particular resort you visit, you're on for the same level of happiness and excitement. The moment you see childhood mementos of anything Disney, you'll be outrightly transported to a whole lot of fun. We stayed for almost 2 days at the park and believe it or not, we were still unable to cover everything. On Day 1, we were lucky to have a photo opportunity with Mickey and Minnie in a breeze since the queue was surprisingly not too long. Of course any visit to Disneyland won't be complete without having a photo with these well-loved characters, isn't it? ﻿ If you're a frequent shopper at any leading supermarkets around the island, you've probably have seen some new noodle products gracing the supermarket aisles. If you're observant enough, Prima's New Curry La Mian would have definitely caught your attention as it did for me. After the successful launch of Laksa La Mian, another kin of its kind had arrived in the market in the form of aromatic Curry Flavor. Simply true to its claim, the room was filled with creamy, curry aroma the moment the curry paste and curry premix hit the pot with hot water. As it continues to simmer, a promise of gourmet indulgence is evident from the steaming instant noodles. In fact, it was a hint of gourmet goodness.